We were blindsided. She had some delays and the signs were all there but we were blind to them. The six-week wait for her appointment with the developmental pediatrician was long and painful. All I saw was autism in those weeks – her expressionless birthday party, loss of words, the fact she had not once touched her play kitchen all was making sense now. She was diagnosed right away at the end of her first assessment. We took Brie in for second and third opinions, each time expecting to hear something different, but all three came to the same conclusion, Brie has autism. She is verbal but she is thought to be on the more severe end of the spectrum due to her disconnection with people. ABA has been the biggest asset in Brie’s journey. 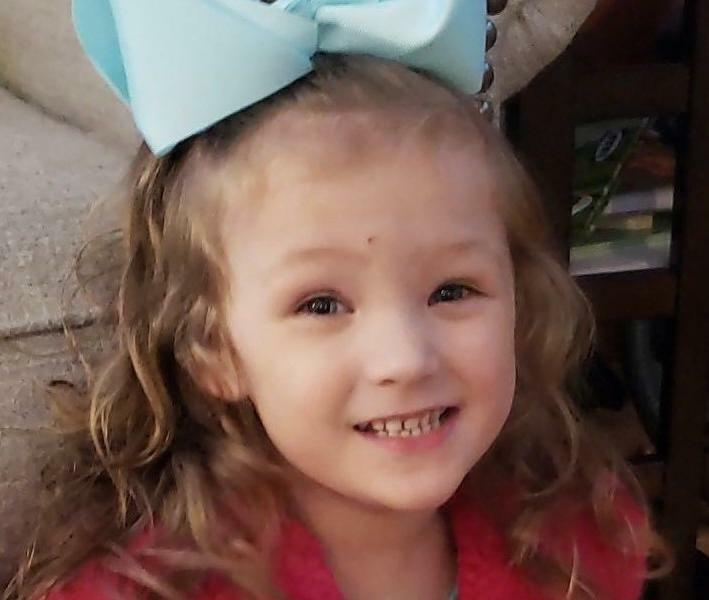 She started at 2½ years old as a non-verbal little girl, and since then has learned how to request items, knows all her numbers, letters, colors and shapes, and is now working on identifying feelings and socially appropriate greetings and goodbyes. Ask anyone who knows Brie, and they will tell you she is a smart and funny little girl, and quite the character! She is a bright shining light in this world and everyone who knows Brie, loves her. In the beginning, it was hard to look past the autism diagnosis. The further we get in our journey and the more we learn about ASD, the more completely normal it is to us. She sang before she talked and loves anything to do with music. She fixates on things – her current treasure stash is filled with ponies and unicorns. My favorite habit of hers is that she sorts almost everything…toys, markers, bathroom products, dish towels, the list goes on and on. Every time I find sorted objects, I can’t help but smile. I can’t imagine her any other way and don’t want to, she is exactly who she is supposed to be! Around the same time that Brie received her diagnosis, our family moved to northern Minnesota. Trying to find services up north for her was a nightmare. We spend four hours a day driving just so Brie can receive ABA. This is the harsh reality of living beyond the metro area. The biggest reason we will participate in the Fraser Walk for Autism is for the hope that autism services will expand out from the metro and become more easily accessible to those in the rural areas of Minnesota. We preach and hear all about inclusion and acceptance, but those things do not and will not come easily if these kids don’t have access to resources early on. I can’t imagine how our journey would look today if it were not for ABA, speech and occupational therapy. It pains me to think about all the hard work, time and sacrifices our family has made all out of love to get Brie to the point she is at today just to lose it due to there being no programs locally for ASD kids her age. Who knows how long driving four hours a day, three days a week will be sustainable? I think about all the other kids in our area who are diagnosed or undiagnosed and don’t have the means to travel for services. What will happen when they reach kindergarten? Will interventions for them be more difficult at that point? If they had access to services, would kindergarten be a smoother transition for them? I know the answer to that last question – absolutely yes. More interventions early on = more inclusion in the classroom setting in kindergarten and beyond. The Fraser Walk for Autism is Brie and our family’s first big walk, so we are just learning the ropes, but our mission is big and just like we do with autism, we expect to learn and grow from each experience and advocate to make the entire Minnesota community an autism-friendly one.